A new book by Neil Daniels called, "Metallica - The Early Years And The Rise Of Metal" is set for release on May 28th, via Independent Music Press. This is the first and only book to look at the massive impact of Metallica’s first four albums on the international metal scene. This book shows the birth and rise of the monster known as Metallica and will link the band – and the American metal scene – with the famed New Wave of British Heavy Metal movement in the UK and metal originators such as Black Sabbath and Judas Priest. Metallica’s early success was built on strong live performances and fierce thrash metal riffs. The group would eventually become the biggest American metal band in the world and the legacy of those first four albums – Kill ‘Em All, Ride The Lightning, Master Of Puppets plus …And Justice For All – lives on to this day. American thrash metal produced four major bands – Metallica, Slayer, Megadeth and Anthrax – dubbed the Big Four, but Metallica are the kings. This book tells the story of how that remarkable global triumph started, complete with examples of very early memorabilia and exclusive interviews from people who saw those early gigs and can provide eye-witness accounts of this incredible story. 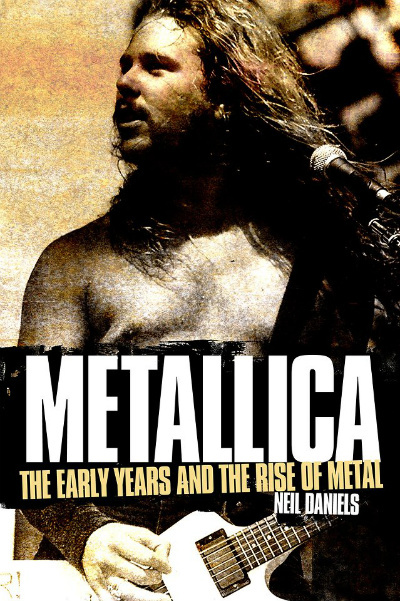 Metallica - The Early Rise And The Rise Of Metal includes a foreword by Brian Tatler of Diamond Head and contributions from Bailey Brothers, Biff Byford, Jon Collins, Jess Cox, Bernard Doe, Mike Exley, Bill Hale, David Konow, Joel McIver, Bob Nalbandian, Martin Popoff, Ron Quintana, Brian Rademacher, John Ricci, Brian Ross, Xavier Russell, Brian Slegal, Brian Tatler, Ron “Bumblefoot” Thal, John Tucker, Michael Wagener and Jeff Waters. Neil Daniels has written about classic rock and heavy metal for a wide range of magazines, fanzines and websites. He has written books on Judas Priest, Robert Plant, Bon Jovi and Journey. The book is available for pre-order.